After the long winter of shortened days, it’s so refreshing to prepare and decorate the house & garden with Spring flowers and foliage. At a time when the herbaceous borders are just starting to surface, indulge in a trip to a local garden centre or an online splurge to seek out bright bulbs and acid green shoots. Next, choose a fine day for some speedy planting up of planters and pots that can be positioned on patios, paths, by doors, in window boxes and even brought inside to place in well-fixed wall boxes. For Garden Requisites metal window boxes, we always like to get ahead with prep for a sneaky switch of seasonal pots and planters. Storing spare containers in the wings means you can take time to plant up a few at a time, swapping last season’s displays as you come to them. We can also supply snug fitting troughs for planting in situ. Aprons on! Spring planting doesn’t have to be a full-on clash of exceedingly vibrant colours but it does give sleeping senses a good jolt. Monochrome planting can lend prettiness at lower volumes. Go with an extension of interiors and garden themes, also keeping in mind the age and style of the building. For mid to late Spring plants, take your pick of endless hues and heady scents of Tulips, Daffodils, Hyacinths, Grape hyacinths, Ranunculus and even hardy-ish herbs such as young Rosemary, certain Thymes, and Sage. Some of these can also revive more permanent, topiary planting, softening formal edges. If in need of more visuals, scoot on over to our Spring Window Box Pinterest board. We love the latest craving for ‘bringing the outside in’. Done well, plants on shelves and in wall boxes, indoor planters, wall-fixed plant frames and through to window boxes, all can create movement, colour and texture and breathe life into bright spaces. Our window boxes can also be prepared to order as wall boxes that can not only be fixed to walls in the house but on garden walls, in porches and along house walls themselves too. Have a look at our House Planters & Wall Boxes Pinterest board for further creative inspiration. Window boxes can bring life to a variety of different architectural facades – from a single, fresh herb box on a country cottage kitchen window sill to the super-smart effect of multiple matching window boxes fixed across all three storeys of a period townhouse home, hotel or offices. 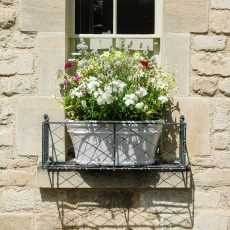 All Garden Requisites’ metal window boxes are handcrafted in our workshop near Bath, constructed in weatherproof, zinc-galvanised steel to last for years and to provide the required sturdiness and strength to hold heavy pots and earth. As always, we’re really happy to advise on fixings and installation for different wall and sill materials and can create made-to-measure window boxes for awkward spaces. Finally, do share your creations with us via twitter, facebook and instagram. We’d love to see the results! #SpringWindows #SpringPlanters.